Enchanting beaded jewelry that is made in small villages of Guatemala, the colorful style is distinctive to that region. These necklaces and earrings are bursting with glass from Czech republic and natural gemstones, easy to wear with magnetic clasps! We show you the EXACT piece you can purchase, as each handmade item varies slightly. 19 inches long, closes with magnetic clasp hidden within cap of beads. The neck chain is a woven rope that looks like 3 twisted bead strands (but they are woven closed), then along the front 6 inches are dangling crystals and glass beads, dropping up to 2-1/2 inches long in the front. Featured colors are bronze and bright olive/peridot greens. 19 inches long, closes with magnetic clasp hidden within cap of beads. 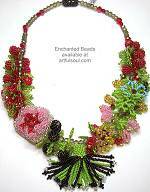 The neck chain is a woven rope that looks like 3 twisted bead strands (but they are woven closed), then along the front 6 inches are dangling crystals and glass beads, dropping up to 2-1/2 inches long in the front. Featured colors are white, pearl, icy clear and silver. 19 inches long, closes with magnetic clasp hidden within cap of beads. 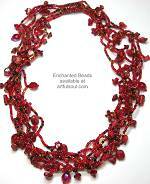 The neck chain is a woven rope that looks like 3 twisted bead strands (but they are woven closed), then along the front 6 inches are dangling crystals and glass beads, dropping up to 2-1/2 inches long in the front. Featured colors are bright orange, pink grapefruit, and golden topaz. 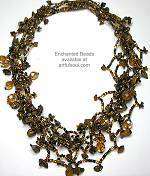 Read about what others think of Enchanting Beads jewelry! Instead of reviews for a specific product, this is a place to share about the designer line in general.